Warning: Invalid argument supplied for foreach() in wf_crm_admin_form->buildParticipantTab() (line 930 of /home/site1/public_html/sites/all/modules/webform_civicrm/includes/wf_crm_admin_form.inc). It happens when a contact is added to an event. I have attached a screen capture. A new part in the form has appeared. No idea where from. I think this might be causing the issue. See attached for for more information. It turned out to be a problem with Custom Data (civicrm/admin/custom/group). 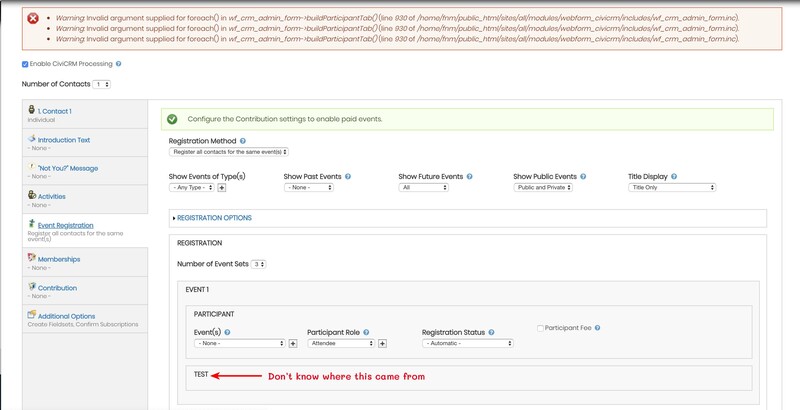 A Set of Custom Fields had been created for participants without any fields added. I removed the group and problem is fixed.